IF BUILDING A RESEARCH TEAM were like choosing players for dodgeball, it’s fair to say that most of the time, kids would get picked last. After all, with no degrees, limited work experience and hardly any published works, how could a child ever hope to get in the game? And why would they even want to? For Roberta Woodgate [BN/89, MN/93, PhD/01], bringing children and youth onto her team is a win for everyone involved. 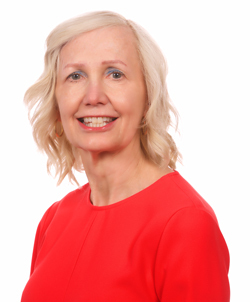 “In the past, research was more often performed ‘on’ children, as opposed to ‘with’ them,” says Woodgate, a professor in the College of Nursing who was recently awarded a prestigious Tier 1 Canada Research Chair in child and family engagement in health research and healthcare. Woodgate, who is also a researcher with the Children’s Hospital Research Institute of Manitoba, says those who study children’s health have rarely included kids’ and teens’ perspectives in the process. That has left serious gaps in our understanding of child health. It has also denied participation to those who are most affected: the patients themselves. Woodgate and her research team embrace a human rights-based approach that recognizes children’s right to be involved as much as possible in decisions that affect them. It’s not always easy to find the words to talk about those experiences and feelings, especially when a serious illness is involved. That’s why Woodgate uses innovative, artsbased data collection strategies, offering children and their families alternative ways to express themselves. One technique she uses is called photovoice. Participants choose images to help voice their pain, fear and other emotions. One 18-year-old study participant shared a photo of a Halloween decoration – a menacing character with a black robe and a pumpkin head with glowing eyes. “This one is a picture of what anxiety sort of looks like in my head,” the participant said. Another arts-based method is to provide patients with a computerized drawing tool. One participant was a teenage girl with leukemia. Most such patients have to stay in hospital for three to five weeks during one phase of their treatment. How did that feel? Her answer was to draw a sad-faced girl behind prison bars, with the label “hospital.” She couldn’t have been more clear. To share youths’ voices, Woodgate has developed an interactive web platform similar to a video game, YouTube videos, participatory film and digital storytelling projects, photography exhibits and a dance project. The professor, who joined the faculty in 2000, has the distinction of being the first-ever faculty member at the College of Nursing to receive a Canada Research Chair. The seven-year funding that comes will the chair, she says, will enable her to make important contributions to the knowledge base of how to best engage child patients and their families. Woodgate emphasizes that dialogue and collaboration with children and youth are fundamental to her work. “There was a time when kids wouldn’t have been involved in this way,” she says. “People said they didn’t have anything to share. But the truth is, we can’t know what their experience is because we haven’t lived it. That’s what makes their input so vital.